“Architecture for Nature” is the first formation project promoted by Livio Felluga, based at Vigne Museum, a permanent installation by Yona Friedman with Jean-Baptiste Decavèle, created in 2014. Hosted by the company, 12 young architects, coordinated by NOW New Operation Wave – NOW Radio, will participate in an experience in close contact with the territory while respecting the criteria of autonomy, adaptability, sustainability, self-organization and self-planning. The created projects will be presented at a conference organized by the Vigne Museum with No Man’s Land Foundation and developed in 2018 thanks to the collaboration with Cluster Arredo e Sistema Casa. Audio excerpts, interviews and reflections will be documented on NOW Radio broadcasted on RAM LIVE, the web radio of RAM radioartemobile. NOW – New Operation Wave invites you to take part in a journey setting off from La Montagne de Venise in the Venice Lagoon and leading to No Man’s Land in Loreto Aprutino. Both interventions by Yona Friedman with Jean-Baptiste Decavèle, that have had the active participation of NOW, are connected with the territory through their adaptable nature. They are not defined locations, nor are they pre-established architectural models, but rather they constitute a background for the development of a new vision of architecture. The NOW Check-point is set up as an extemporaneous residency where young architects, artists and curators will be involved in the creation of a choral site-specific project based on the single modules making up the Montagne. The four days will include discussions and moments of experimentation via simple actions. This platform will allow the possibility to think of the imaginable and improvisable alternatives parallel to the current scenes within the world of art and architecture. On the boundary between the two is born the willingness to create new images, far from the idea of a building or the mere object of a work of art in a world overflowing with constructions. It is up to our generation the pursue Friedman’s idea of a realizable utopia, developing new visions. Reinventing the city, parks, districts and ports as places of possibility and of exchange. A new NOW meeting will take place the 2nd and 3rd September 2016, as an anticipation of the workshop to be held in Vigne Museum. It is open to everybody but you have to play! “We are free. You choose your limits.” says Yona Friedman concerning No Man’s Land and the concept of limit. The starting idea of the meeting was born from this sentence. The aim is to discuss the concept of border as a limit of physical spaces and disciplinary fields. NOW intends to blur the boundaries between art, architecture and cross the limits that confine all of us in a specific field. This encounter will be held in No Man’s Land, a private territory donated to the community, without borders, open to everyone. “No Man’s Land belongs to everybody.” Y. F.
NOW staff and the bravest participants will spend the night inside the intervention in No Man’s Land, precisely inside the stone tapestry by Friedman/Decavéle. A territory without boundaries is a representative place for an artistic nomad generation. The purpose is to create a conceptual No Man’s Land, fertile for planting and growing new ideas and collaborations. The overcoming of a defined territory will be supported by the use of Internet linking different countries in the same place, creating a juxtaposition between new technologies and natural environment. The virtual round table will take place at Spazio Di Paolo, an interdisciplinary space that mixes arts, photography, packaging design, food and beverage marketing. NOW members / Zerynthia Contemporary Art Association /different architectural and artistic realities/ students and professors of the Academy of Fine Arts of L’Aquila / students and professors of the faculty of Architecture of Pescara / students and professors of Art High Schools in Pescara. We will explore the work of Friedman and Decavèle through mapping games. NOW staff and the bravest participants will spend the night inside the intervention in No Man’s Land, precisely inside the stone tapestry by Friedman/Decavéle. It is open to everybody. For participating: bring your camping equipment. The second day , a round table will be held at Spazio Di Paolo – Viale Europa 129/E, Spoltore (PE). The round table will be broadcasted live on RAM radioartemobile the 3rd September and will be part of a special episode of NOW Radio, the weekly program of NOW on-air every Thursday at 10 PM. 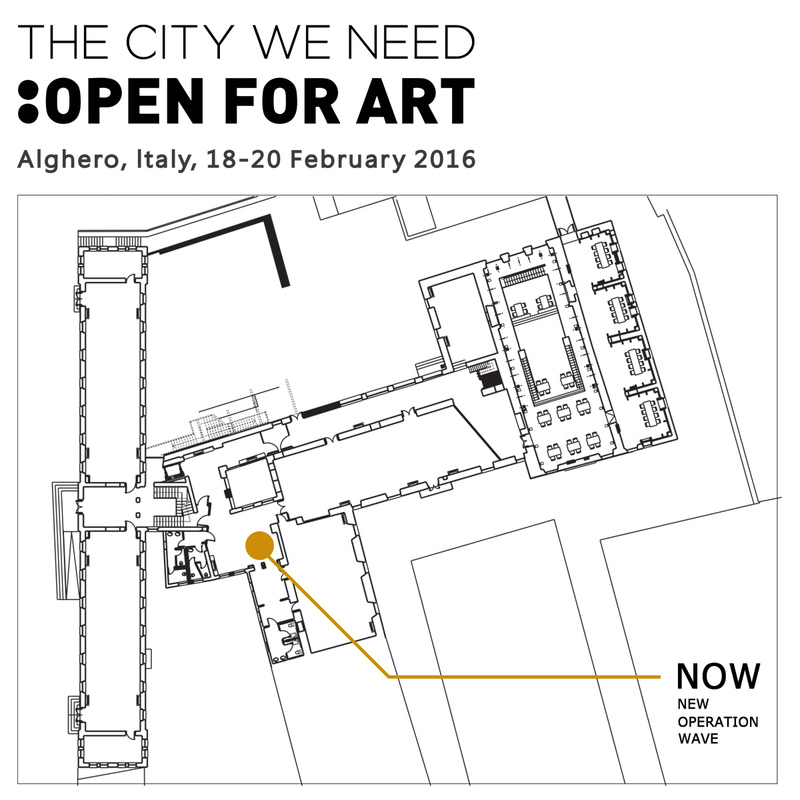 The NOW workshop will be held from 18th to 20th February 2016 at the Department of Architecture, Design and Urban Planning at the University of Sassari’s Alghero campus as a part of the Urban Thinkers Campus “The city we need: open for art” centred on the relationship between art, city life and urban environment. The meeting is part of a series of 28 Urban Thinkers Campuses that will culminate with the international conference UN HABITAT III in October 2016. On 16-18 October 2015 Zerynthia, comparable to a homepage, opened its spaces to the second NOW network meeting. NOW’s desire is to reinforce and amplify communication between young curators / artists / students through the creation of a work group made up of participants of the various Academies and Cultural Institutions. Through the network, it’s possible to recreate an original public made up of the players themselves. Let us imagine the participants as viral elements capable of launching, through confrontation, new possibilities and positive contaminations. During the meeting the group worked on spontaneous vocabulary, using a childhood game. Words proposed by all the participants give life to a work in progress that will be developed the coming months. NOW (New Operation Wave) is a new network founded at the end of 2014, a platform including different public and private institutions, italian and foreign ones, to connect and create together cultural and artistic initiatives and activities. The network is coordinated by Zerynthia, Roma and includes as partners: Accademia Belle Arti di Roma; Accademia di Brera, Milano; Fondazione Antonio Ratti, Como; Wiels, Bruxelles and De Appel, Amsterdam. The Main objective of NOW is related to the field of education, research and experimentation. Common operations include the organization of study days among the network’s partners and workshops with students of the curatorial courses and young artists.